Tooth and gum pain can be extremely frustrating, and the best way to manage gum problems is to prevent them from occurring in the first place. However, if you are already suffering from symptoms of gum problems, the best way to deal with them is by learning what the do's and don'ts of gum problems are. Continue reading to find out more. If you are suffering from gum problems, it is best to choose foods with soft, watery textures. 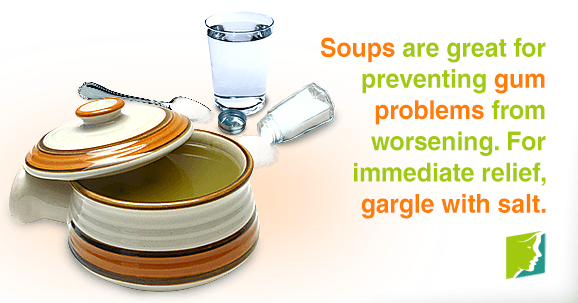 Soups and steamed vegetables are excellent because they are easily consumed and prevent you from running the risk of exasperating the problem by biting down on something hard or getting a food particle stuck between your teeth. By eating anything that is too hot you could exacerbate any gum problems that you might have already developed. If you make yourself a cup of tea or coffee, then it's best to let it to cool down to a tepid temperature before drinking it. Likewise, make sure that any food you prepare is cool before consumption. Salt, especially sea salt, can do wonders for managing gum problems. If you feel any gum pain, try mixing a teaspoon of sea salt together with a cup of water, and use the mixture to gargle with and run it over the painful gums. This should bring some immediate relief, and will also help to reduce swelling. Avoiding processed or prepackaged foods is one of the best ways to manage gum problems. These foods are often high in sugar, salt, and fat that can make painful gums worse. Processed carbohydrates should also not be consumed if you are struggling to manage gum problems. Excessive amounts of animal saturated fats might also worsen your symptoms, so it is best to stay away from them while you are suffering from gum pain. If you are concerned about any underlying issues you may have regarding your gum health, then the very best thing you can do is visit your dentist or hygienist. He or she will be able to give you medical advice based on your personal circumstance, allowing you to treat your symptoms. The best way to manage gum problems is discovering more about them. Following the dos and don'ts discussed in this article will help you prevent and reduce pain, infection, and swelling in your mouth. If you have any concerns about any symptoms you are suffering from, please consult your dentist to discuss them. Gum pain can be a frustrating and painful condition. Fortunately, there are foods you can eat in order to soothe pain until you are able to see a dentist.